My favourite film of 2016, Jenkins' movie is a poetic study of sexuality, masculinity and identity that maintains a delicate balance between his lyrical style and an earthy focus on everyday experiences. The ensemble cast is phenomenal, with Naomie Harris, probable Oscar-winner Mahershala Ali, and Janelle Monáe being especially fantastic as the adults helping or hindering young Chiron through his childhood, adolescence, and adulthood. My fifth favourite film of 2016, and one which infuriated me by complicating my longstanding dislike for all of Villeneuve's work. A thoughtful, emotionally devastating work of science fiction whose plaintive calls for communication and understanding feel especially poignant in a year defined by hatred and misinformation. My eleventh favourite film of 2016 and one of the year's most distinctive documentaries. The way Johnson weaves together offcuts from documentaries she shot for other directors - including Fahrenheit 9/11, The Invisible War and Citizenfour - and her own home movies serves both as a playful deconstruction of documentary filmmaking itself, and as a meditation on how the line between art and life can be so painfully blurry. Not only one of my favourite films of the month, but one of my favourite "older" film discoveries of the year, it's a great documentary about faith and personal growth. It's so rare to see people in real-life change their viewpoints in the drastic way that Rob Schenck does, going from pro-gun alongside other conservative evangelical leaders to passionately anti-gun when he realises that it fundamentally clashes with his pro-life beliefs, and Disney and Hughes do a wonderful job of capturing the different stages of his intellectual and spiritual evolution. My sixteenth favourite film of 2016. Not as good as Fish Tank, which tells a similar story in a more concise way, but a gorgeously shot, amorphous and enveloping movie which places the personal journey of self-discovery of a young woman (Sasha Lane) against the beautiful, sometimes desolate expanses of the Midwest. When I was younger, I was pretty dismissive of movies described as "middlebrow" by critics. (Though, in my defense, that's not the most appealing of sobriquets.) While I still tend to be wary of any film that seems to have been made with awards in mind, particularly biopics and adaptations of "serious" literature, or which aim for the kind of broad acceptance that requires the sanding off of any and all edges, I've learned to consider them on a case-by-case basis, since there's value in telling a capital-I important story in an accessible way, even if it's not the most formally or narratively daring approach. 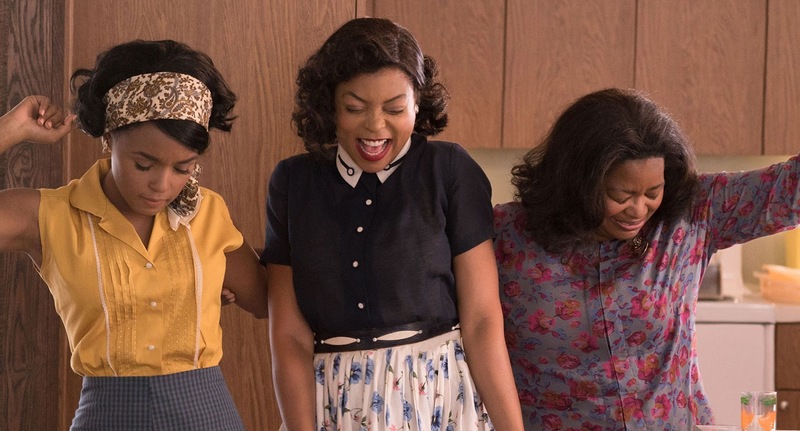 Enter: Hidden Figures, one of the best examples of an uplifting, mainstream Hollywood movie that I've seen in years. Melfi's film tells the story of three African-American mathematicians working for NASA (played by Taraji P. Henson, Octavia Spencer and Janelle Monáe, making her second appearance on this list) who were crucial to the success of John Glenn's mission to orbit the Earth. It's a sparky, energetic movie with a great ensemble cast, one which avoids the pitfalls of being stodgy or feeling like homework, but what sets it apart is its nuanced depiction of racism in 1960s Virginia. While there are moments of overt prejudice depicted, for the most part it's about institutional racism, and how people who would never consider themselves racist - such as the characters played by Jim Parsons and Kirsten Dunst - still did and said racist things because they were born into a fundamentally racist society, and believed in preserving the status quo that had existed for decades. The film also manages to subvert the White Saviour archetype by having Henson's boss (Kevin Costner, doing great work) tackle segregation in NASA facilities not because he's the only one who can see that it's wrong, or because he has a great moral revelation, but because he discovers that having separate White and Colored bathrooms hurts the efficiency of his team. It's a fantastic film that has only grown in my estimation as time has passed. My seventeenth favourite movie of 2016. Could have easily been one of those insufferable indie dramadies that comes out of Sundance with a lot of buzz then is promptly forgotten about, but ends up being a gentle and deeply felt movie about believably broken people trying to do their best. My twenty-first favourite movie of 2016. Probably Nichols' least cohesive film to date on account of its uneasy blend of intense character drama and odd science fiction thriller, but the cast manage to bring a lot of emotional realism to an at times ill-defined concept, making a story that could be cheesy or incomprehensible into an affecting story about faith and parenthood. It always feels churlish to point out that an adaptation of a play feels like an adaptation of a play, but boy, does Fences feel like an adaptation of a play, at least for its first twenty minutes or so. The cast's breathless delivery of August Wilson's dialogue, mixed with attempts to "open up" the story by having those conversations happen in a couple of different locations, makes what should be scene-setting feel intensely stressful. Once the film settles down, the story of a garbage collector (Washington) and his strained relationships with his wife (Viola Davis) and children in 1950s Pittsburgh develops a compelling rhythm of its own. It's a showcase for powerhouse performances from superb actors, one which overcomes its early hiccups to become a fascinating study of inter-generational conflict in one family about what it means to be a father, a man, and black in America during a turbulent, changing time.